Overprotected, we will fail when something dangerous, unexpected, and full of opportunity suddenly makes its appearance, as it inevitably will…. Too much protection devastates the developing soul. At the turn of the [20th] century, British naturalist Alfred Russell Wallace wrote about a lesson he learned from observing cocoons. After spending several hours watching a large moth trying to break out of its cocoon by beating desperately with its undeveloped wings, Wallace couldn’t bear to watch any longer. Using a sharp knife, he split the cocoon and freed the moth. In the following days, however, Wallace saw that the moth was not developing naturally. Missing were the beautiful tints and shades of color that should have come into its wings. And the wings were severely stunted. In a few days, the moth died. 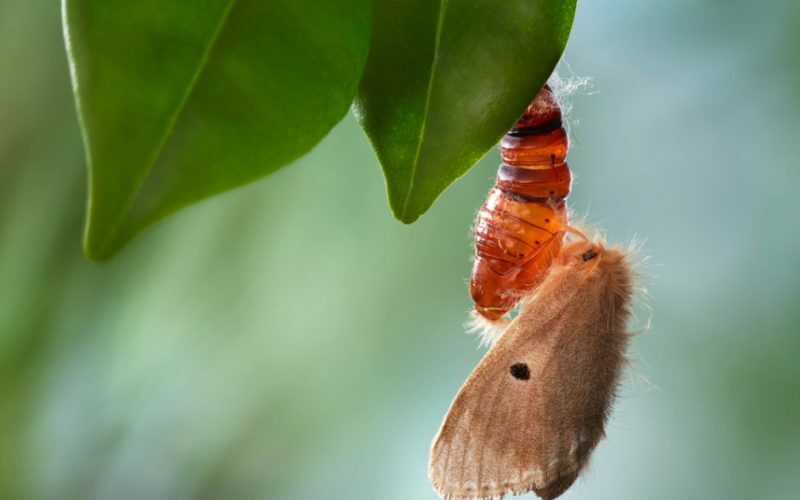 Wallace realized then that the struggle against the cocoon, which he had interrupted, was nature’s way of strengthening and developing the moth’s wings. The same principle is true for us. Often, dark times are the cocoon God uses to strengthen us spiritually and emotionally…. If life is too easy, we will never develop into the human beings God meant us to be. I used to teach my students the same lesson but with a nautical twist. My classroom motto was: A smooth sea never made a skillful sailor. Jesus asserts, “Whoever wishes to come after me must deny himself, take up his cross, and follow me.” But how will young people ever learn to carry the cross, how will they become great, if we adults are forever shielding them from every difficulty in life? I owe my success to my mother. You see, I was the first person in my community back home ever to go to college. All my friends and neighbors turned out to see me off. One week later, however, I phoned home, overwhelmed with a sense of homesickness. “Mama,” I sobbed, “I want to come home!” Mom responded, “Honey-child, you can come home any time you want, but if you come home before Thanksgiving, it had better be in a pine box!” I was stunned, and before my mother slammed down the phone, she said with all the gentleness of a marine sergeant, “Now you make your mama proud!” I knew then and there I had to grow up. We do young people no favors by shielding them from all of life’s struggles. Worse still is when we shield them from the consequences of their negative behavior. As a former teacher, I can tell you stories of parents who belligerently defended their cheating children when the evidence was right before them. I can tell you of parents who lied to cover up their children’s misdeeds, and who even aided and abetted their offspring in the very act of wrong doing. Talk about helicopter parents from hell! With parents like that, who needs enemies? When I was about nine years old, my mother asked me to take out the garbage, and I gave her an attitude. She said nothing, but the next day, she called me into the living room. My older siblings waited in the kitchen in gleeful suspense. They knew what was going to happen. Mom sat me down on the sofa and began her monologue: “Joseph, you know I could have married men who were better looking and smarter than your father. But I chose to marry your father. Why? Because I was thinking of you, Joseph! I knew he’d be a good provider for you. And when I was carrying you before you were born, I took good care of myself and made sure I ate well and got enough sleep. Why? Because I was thinking of you, Joseph! And when you were a wee thing in the diapers, crying because you messed yourself, I didn’t let you sit in it. I stopped what I was doing and changed your smelly diaper. Why? I was thinking of you, Joseph! Well, I wore that awful diaper pin for two full weeks. Years later, when I would come home from the seminary for a visit, I knew I still had to watch my p’s and q’s with Mom, or she’d make me wear that pin again. Thank God for parents and teachers who occasionally say no! I had no qualms about telling my students, “In a word, no! In two words, no way! In three words, not at all! In four words, not on your life! In five words, absolutely, positively, and unequivocally no! In six words, no and a thousand times no! In seven words, what part of no don’t you understand? In eight words, I am disinclined to acquiesce to your request.” I’m sure the kids were rolling their eyes, but no matter. I didn’t see them! In short, we must teach young people the fine art of carrying the cross, whether it be the inevitable cross that life throws them or the self-imposed cross resulting from bad choices. Either I carry my cross, or I become one. It’s just that simple. True greatness comes, not by avoiding struggles, but by embracing and overcoming them with the help of God. That, I think, is at least part of what Jesus means when He says, “For whoever wishes to save his life will lose it, but whoever loses his life for my sake will find it.” If we always take the easy way out, we court disaster. If, however, we face our struggles head on, we grow into greatness. We are in this one respect very much like moths. Without facing life’s struggles, we shall never learn to fly. The ancient Romans said it best: Poenae sunt pennae. Pains are wings. Where Main Street Meets the River, Chapter 27 (New York: Rinehart & Company, 1953), p. 337. I hope my memory serves me well. I wish I could find the actual article. “Discipline that Lasts a Lifetime,” a 2009 CD produced by Lighthouse Catholic Media. This line comes from the 2003 movie The Pirates of the Caribbean: The Curse of the Black Pearl.